What a fantastic and motivating video! If interested, please contact me at edjfryer@rogers.com . Durham Attack Sliders Go Provincial with Sitting Volleyball! 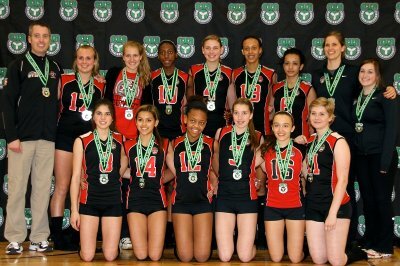 Durham Attack Volleyball Club has had teams from 12U to 18U participating in competitions across North America for 20 years. When the idea to enter a Sitting Volleyball team in a demonstration at the Ontario Volleyball Association Championships was proposed, the club jumped at the chance. Sitting Volleyball is a Paralympic sport that started after the second world war as a rehabilitation activity for injured soldiers and has grown into a highly competitive team sport for both men and women. Durham Attack’s involvement with the sitting game started a few years ago when the club hosted Canada’s National Women’s Team for a weekend training camp at Camp Madawaska. On the same weekend the club was running their September orientation camp for the u16 to u18 teams. The clubs able-bodied athletes were introduced to an exciting Paralympic sport and had the chance to play with and learn from the National Team players. Involvement with Parasport continued through the winter as DA held sitting volleyball drop-in sessions that were open to the public as well as club athletes. The weekly drop-in has evolved into an opportunity for local athletes with a disability to train with skilled volleyball players, allowing the para-athletes to continue to develop and keep their game sharp. 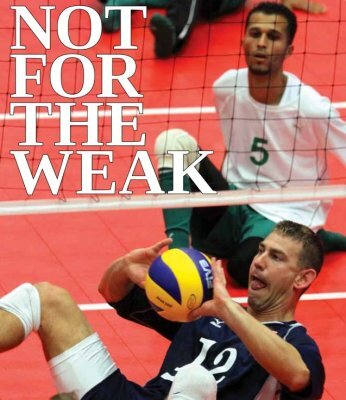 In the Spring of 2011, with support from The First Contact fund of the Canadian Paralympic Committee, the idea of introducing the membership of the Ontario Volleyball Association to the sitting game was born. Durham Attack and Ontario Volleyball Association were both successful in receiving a grant and it has allowed each organization to ensure programming is accessible for all Ontarians. In autumn of 2011 Durham Attack used part of their CPC grant to send two club coaches to men’s and women’s national sitting team training camps in Edmonton and Calgary. There they participated as assistant coaches for the weekend long camps and gained valuable knowledge and experience to bring home to the club. The weekly drop-in sessions continued as before with club volleyball players sitting down to train with parasport athletes, however now they had coaches with sitting volleyball experience and a new goal. The Ontario Volleyball Association, along with Durham Attack and Ottawa Fusion Volleyball Clubs, organized and hosted a demonstration match at the Ontario Championships at RIM Park in Waterloo. The Ottawa Fusion Volleyball Club, who have spearheaded their own sitting volleyball programming, arranged for a team to compete against Durham Attack for the ‘very unofficial’ Ontario Sitting Volleyball Championship. DA’s team, The Sliders, was a fully integrated group, selected from the u14 boys, u14 girls and the athletes with a disability that were regulars at the weekly drop-in sessions. The Fusion team was their u15 boys team that was also competing in the able-bodied provincial championship the same weekend. Match day at RIM park was a busy affair, as should be expected with games on 30 courts in one facility. The sitting volleyball court was set up near the main entrance directly in front of the upper gallery viewing area for maximum exposure. The friendly spirit of the event came out early as some of the DA players went over to the Fusion side of the court to help them run a few warm up drills. A quick review of the rules with some of the OVA officials who were standing nearby and even they wanted to try their hand at ‘whistling’ the match. A fun filled, enthusiastic match ensued with hundreds of spectators in awe of the skill and physical demands of this high speed, precision Paralympic sport. The eventual winners of the match were Ottawa Fusion. Durham Attack, never a club to accept defeat lightly, is already planning their program for next season. Keep an eye on the DA web site; http://www.durhamattack.org/ for details if you are interested in participating as a player, coach volunteer or supporter, all are welcome. For more information on Ontario Volleyball’s Sitting Volleyball program and resources, please visit www.ontariovolleyball.org. On May 20-22, at the NATIONAL CHAMPIONSHIPS at the Direct Energy Centre in Toronto, our Durham Attack 17U Girls’ Team finished an already incredible season with a GOLD medal win in DIVISION 1, TIER 1. Our girls had an amazing three days, placing first in their pool on both the first and second day of the tournament. On the third day, they went straight into their Quarter Finals against South County Bandits. Although, there was no doubt that they would get through this match, there is always that fear that this is where it can all end. After having come so far this season, this is not how we wanted it to end. The girls had worked so hard and deserved much, much more. Durham Attack 17U Girls’ Team did make it through their quarters, however, and were next to play the intimidating Diamonds. Our girls played the best they had played all weekend and beat the Diamonds in two straight games. This is when it really started to feel that a Nationals win was definitely within reach. 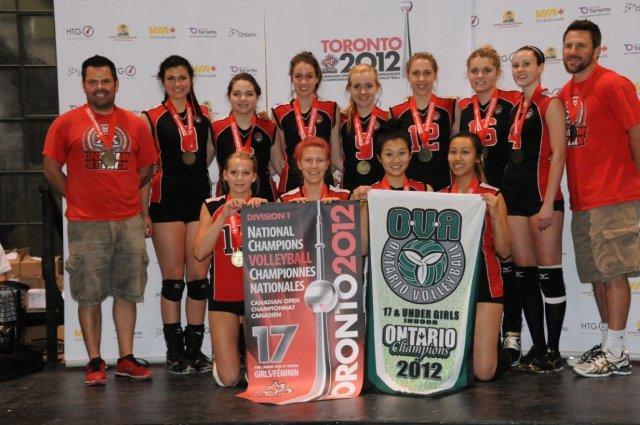 The final match for the GOLD medal was against Lakeside, the team that we beat at Provincials for the Ontario title. So again, the girls knew this wasn’t going to be easy. They certainly made it look easy though, dominating the court, and going on to beat Lakeside in two straight game (25-16 and 25-17), winning the GOLD medal and the NATIONAL CHAMPIONSHIP. The 2011-12 season has been a series of successes for this amazing group of young women. Led by Coaches Kevin Hellyer and Mike Slean, the success of this team was evident from the start when they medaled in their first tournament back on November 26. Our girls continued to impress us with their hard work and determination over the course of the season, which resulted in many more medals in both the 17U and 18U Tier 1 Divisions. They medaled in seven of their eight tournaments, brought home a GOLD medal from the 17U PROVINCIALS, placed fourth at the 18U PROVINCIALS and now a GOLD medal win at NATIONALS – BEST IN CANADA! Thank you and congratulations to the Coaches Kevin Hellyer and Mike Slean, and to the Durham Attack 17U Girls’ Team for making Durham Attack and Canada proud!